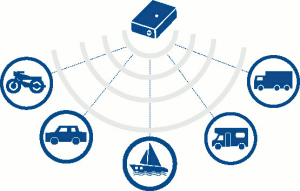 The security increases exponentially when protection systems which work with different technologies are combined together, such as mechanical and electronic ones. This is because thieves, just like other (and most respectable) professionals, tend to specialise in different fields and the number of individuals who are able to neutralise both a mechanical and an electronic system is much less than those who are able to overcome just one of the two. For this reason, if protecting your motorcycle with a good quality mechanical anti-theft device makes good sense, adding an electronic alarm is even better. The problem with the electronic anti-theft devices which are normally offered to someone buying a motorcycle is that they are generally expensive, require the intervention of a specialist installer and cannot be moved from one motorcycle to another. 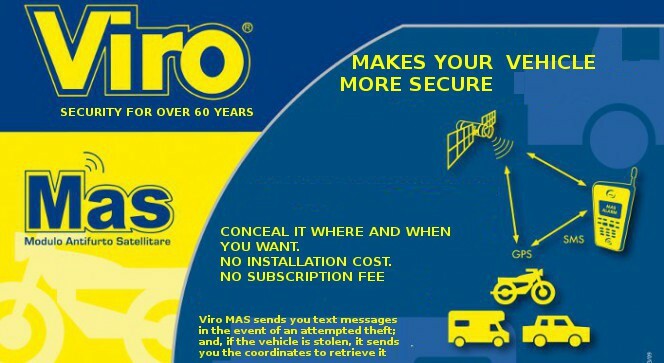 The Viro MAS electronic anti-theft device solves all these problems. The batteries are inserted (4 AA batteries). A SIM card which will be used to send text messages in case of theft or attempted theft is inserted in the slot. A text message is sent from the mobile phone which you wish to connect to the alarm to the number of the SIM card inserted. The body of the anti-theft device (a small black box 8x 12 cm ) is located in a position hidden from view, such as under the seat, behind a side cover, or inside the tailpiece. Viro MAS anti-theft device, complete with GPS antenna and keys. 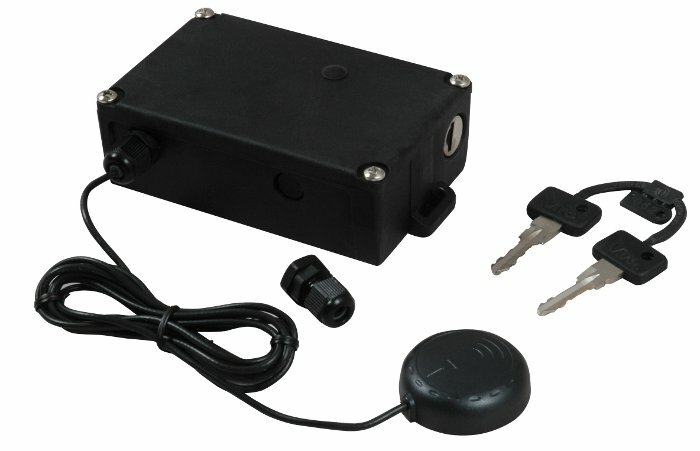 Its vibration sensor detects any theft attempts, which are immediately notified by a text message to the mobile phone connected. The integrated GPS module is able to detect if the motorcycle is moved, and also in this case the owner is notified immediately. The position of the motorcycle is continuously monitored and notified by text messages, which provide both the starting and arrival location. This makes it possible to trace the motorcycle even if it is moved. 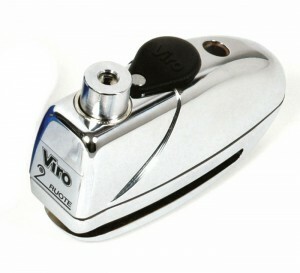 The Viro MAS anti-theft device can be integrated with the Viro Sonar disc lock with alarm. The result is a cross-protection: if the Viro MAS anti-theft device detects an attempted theft it can sound the siren of the Viro Sonar disc lock, whilst if the latter detects an attempted theft it can send text messages using the GSM module of the anti-theft device. The Viro MAS anti-theft device is designed to integrate perfectly with the Viro Sonar disc lock with alarm. The ease of installation not only avoids the costs and delays linked to the intervention of an installer, but also makes it possible to easily move the anti-theft device from one vehicle to another, in case you own several vehicles which do not need protecting at the same time. For example, you can use it on a motorcycle in the summer and on a car in the winter, and then take it on the campervan when you go on a trip. The Viro MAS anti-theft device can be moved easily from vehicle to vehicle. Viro MAS allows you to add a dual protection at just a low cost which helps prevent the theft or find the motorcycle if you have been unable to prevent the theft. It can be permanently installed on one vehicle or moved in just a few seconds between different vehicles. Combining it with a good quality mechanical anti-theft device can certainly help you sleep more soundly. In fact, its existence, its activation and the position of the vehicle on which it is installed are only known by the actual owner, without the involvement of third parties and without the associated issues of privacy, security and costs, related to the presence of service centres and regular subscription fees.